Canoeing Racing has been part of the Balmy Beach Club since 1905 when the Club held its first regatta, but it was 1907 before Balmy Beach joined the Canadian Canoe Association (CCA). In 1924 canoeing was accepted as an Exhibition event at the 1924 Paris Olympics and it was Balmy Beach’s Roy Nurse that led the way with 2 Gold and 4 Bronze medals. Since then, several Beach paddlers have represented Canada at the Olympics. In 1936, at the Olympic Games in Berlin, Germany, Harvey Charters and Warren Saker in C-2 won Silver and Bronze medals. 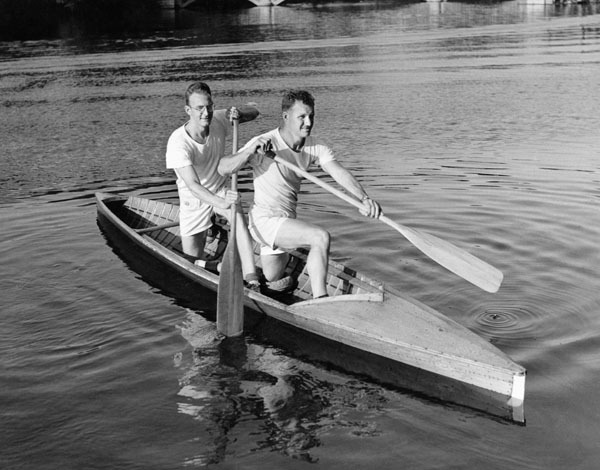 Team mate Bill Williamson was also selected to race in Double Blade singles (Kayaks were not used at this time) Norm Lane, paddling in C-1, won a Bronze medal at the 1948 Games in London, England and brother Ken Lane with Don Hawgood, in C-2 won silver medals at the 1952 Games in Helsinki, Finland. Jim Mossman, head coach of the Canoe Club for over 25 years was selected to coach Canada’s National Canoe Team at the 1960, 1964, 1968 and 1972 Olympics. Balmy Beach has won the overall National Championships (the coveted "Burgee") in 1915, 1919, 1927, 1951 and 1955. The Balmy Beach Canoe Club is celebrating its 100th anniversary in 2005. Interested parties should stay in touch for information on planned celebrations.